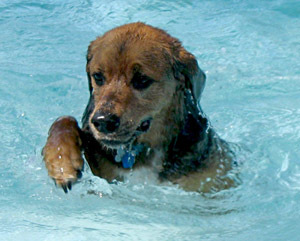 High temperatures in the summer can affect your pet more than you realise. Heat stress can be life-threatening, so it's important to minimise the impact of heat on very hot days. Here are some measures you can take to make the hot weather easier on your pet. Make sure that your pets have access to multiple water bowls and plentiful shade where they can rest comfortably. Avoid walking your pets in the heat of the day. Children’s wadding pools and doggy ice-blocks (frozen dog food and water) can also make the hot weather more fun for your fur family. Animals that are overweight, have heart disease or that are otherwise unwell, require particular care in warmer weather. Symptoms which may indicate your animal is suffering from heat stress include: panting, reluctance to move, obvious distress, and sometimes, vomiting. If you suspect that your pet may be suffering from heat stress, place them in a bath or sink of cool water up to their neck, and then phone your veterinarian. With awareness and proactive measures, you and your pet can enjoy the summer weather without any worries.